Ford Europe has introduced a ton of changes for the European-spec 2019 Ford Ranger including updated looks, more technologies and a new bi-turbo diesel 2.0-liter EcoBlue engine. The Euro-spec 2019 Ford Ranger’s cosmetic updates make it identical to the new North American-spec 2019 Ranger. The most obvious changes are the new grille and front fascia, along with the new xenon headlamps and LED daytime running lights, which are available on well-equipped models. The mid-size pickup truck’s interior has also been upgraded with nicer materials, the latest in Ford SYNC3 infotainment technology and FordPass Connect onboard wi-fi. The new 2.0-liter bi-turbo EcoBlue diesel serves as the range-topping engine and makes 211 hp and 368 lb-ft of torque, giving the truck “greater load-hauling capability,” Ford says. Less powerful single turbo versions of the engine are also available with 167 hp and 128 hp. The 210 hp and 167 hp versions of the engine are offered with either a six-speed manual or new 10-speed automatic transmission. The 128 hp engine can be paired with a six-sped manual or six-speed automatic. The european-spec 2019 Ford Ranger will also be available in Regular Cab, Super Cab, and Double Cab body styles and will continue with standard four-wheel drive. As for active safety, pre-collision assist with pedestrian detection is now standard, while active park assist has been added to the list of options. Ford has also thrown in a new standard system called Intelligent Speed Limiter, which can automatically adjust the truck’s speed to remain within changing speed limits on the highway. 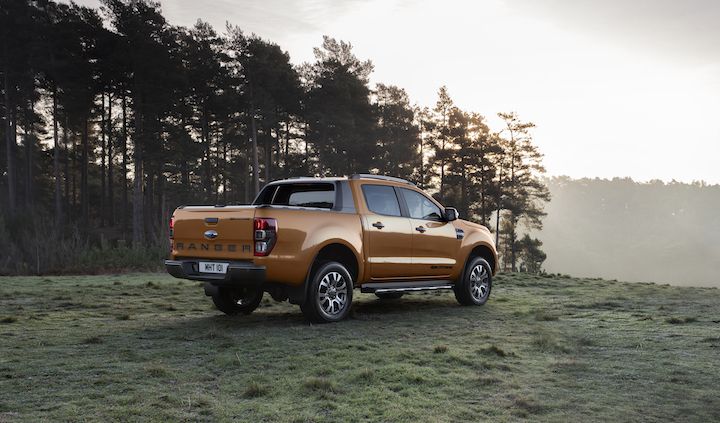 The arrival of the 2019 Ford Ranger also marks the arrival of the new Ranger Raptor model in Europe. The Ranger Raptor features the 210 hp bi-turbo diesel engine and a 10-speed automatic transmission, along with beefed up suspension, underbody skidplates and other off-road ready parts. The Ranger Raptor won’t be offered in North America for this generation, but may arrive with the next-generation Ranger in four or five years. The 2019 Ford Ranger is on sale in Europe now.